He Hooks… and He Shares! Part of my mission is to find projects that I believe are worthy of filming. It’s a really hard task to decide which projects are worthy of spending a great deal of time to investigate, sample and then go through my entire process of getting a video online. I guess based on watching how people respond to topics, pictures and much more. It’s a hint of being intuitive, thoughtful and practical all wrapped into one. For the most part, I get the ideas right most of the time. Occasionally, I have a video that doesn’t perform like I expected to. With being creative, you have to be open to fail, learn the lesson and move forward. The Icy Snowflake Throw Pattern and Video Tutorial are one of those guesses where I slammed a home run. Speaking bluntly, its a project that instantly went viral. I believe there is a number of reasons why it went viral quickly but I won’t bore you with those thoughts. This is a classic example of a project that looks so difficult but is really easy to do. There’s more to it than meets the eye! I think that’s what people love about it. I have noticed people already doing sample squares in really cool colours. Some people have Christmas on the brain while others are looking at this afghan from a different point of view. Imagine if the snowflakes represented flowers instead at spring time! It can take this concept and change it completely. Remember with any pattern, explore your creativity! You may find a hidden gem of an idea tucked in there! This entry was posted in Announcements, Christmas and tagged Christmas, crochet crowd, Holiday, Mikey, Yarn. Bookmark the permalink. 18 Responses to He Hooks… and He Shares! Mikey if this icy snowflake throw is such a big hit than why now is it a private video? I even bought the yarn to make for a lady that is expecting, You did such a great job doing the tutorial. So why take it down??!! 😦 This is very disappointing. Please put it back up. I love this pattern! Never would have attempted it on my own. I’m finished with the blocks and now to the fun part (?). I wish I had thought to connect as I wenf along; that was a great idea! Mikey, I noticed that you modified the snowflake throw pattern from what is listed on the Red Heart page. In the last round Red Heart says to double crochet(dc) in each of the 3 dc at the center of the square where your video tutorial says to dc just in the center dc (3 vs. 1 dc in the last round). I was wondering if this was an oversight on your part or if it tightens up the square when you use a different yarn that the one listed in the pattern? 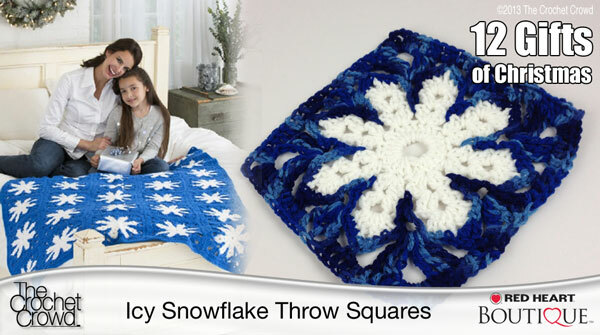 Elizabeth, did you get a reply from your question regarding the snowflake throw pattern? if so what was the reply? Sorry, no I did not. I love all your tutorials, I have started the snowflake afagan, reading the pattern. got me no where, but watching your tutorial, made it easy, thank you Mikey. Thank you for adding me to list.I love all this patterns. Mikey’s tutorial made this project so easy and it’s turning out absolutely gorgeous. I’m making the icy snowflake throw for a very close and deserving friend. Can’t wait to see her face when she opens the box. Thanks Crochet Crowd! You help make my crochet experience a real joy. Love your videos and blog posts! I’ve learned so much about crocheting from watching! You are making a HUGE difference for so many of us. Please know that it is appreciated and that your time and efforts are respected.